If you’re in Long Beach, California, on Saturday, Jan. 31st, head over to Gatsby Books and help celebrate the launch of Joan Jobe Smith‘s latest memoir Tales of an Ancient Go-Go Girl! WHEN: Sat., Jan. 31, 2015, 3-5 p.m.
WHAT: Launch party for Tales of an Ancient Go-Go Girl by Joan Jobe Smith. Please bring a poem to read in honor of Pearl Magazine editor Barbara Hauk (August 1937-Dec. 2014). ABOUT THE BOOK: In Tales of an Ancient Go-Go Girl, poet, historian, and Bukowski confidante Joan Jobe Smith endures ordeals and challenges — and survives to tell the tale. This picaresque true story spans the 1965 Los Angeles Watts Riots, near death at the hands of a homicidal ex-husband, the counterculture go-go swinging let-it-all-hang-out 1960s and 70s, single motherhood, and feminism. This memorable and moving tale — which ends in 2014 with Joan dancing to Doors’ guitarist Robby Krieger — is told with heart and courage and humor. Don’t miss it! Find Tales of an Ancient Go-Go Girl by Joan Jobe Smith at Amazon.com or purchase a copy at Gatsby Books. 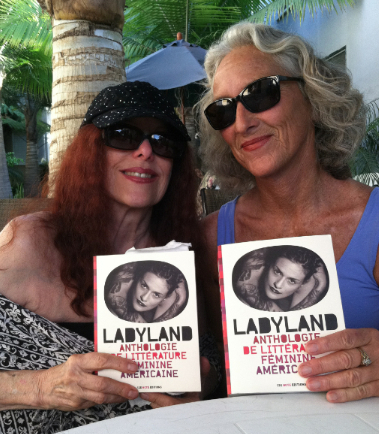 In the above photo, authors Joan Jobe Smith (left) and Tamara Madison pose with LADYLAND, a 496-page anthology of writing by American women — issued by French publisher 13e Note Éditions — that features their work. 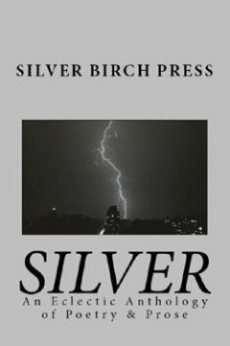 Congrats to Joan and Tamara, whose writing has appeared in several Silver Birch Press anthologies, including our latest release the Silver Birch Press May Poetry Anthology. Learn more about LADYLAND at 13enote.com. The book is available (in French) at Amazon.fr. Très cool! 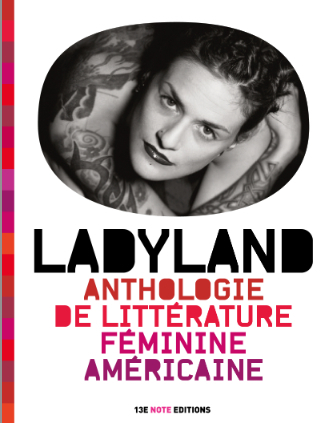 The esteemed 13e Note Éditions in Paris recently released (in French) LADYLAND, a 496-page anthology of writing by American women, including frequent contributors to Silver Birch Press anthologies — Rene Diedrich, Linda KIng, Tamara Madison, and Joan Jobe Smith. Learn more at 13enote.com. Find the book at Amazon.fr. Congrats to all the women who contributed to the collection: Lisa Carver, Antonia Crane, Rene Diedrich, Gina Frangello, Kat George, Veronica Ghostwriter, Fiona Helmsley, Dana Johnson, Linda King, Chris Kraus, Lydia Lunch, Tamara Madison, Cris Mazza, Hulga McSwine, Reverend Jen Miller, Cookie Mueller, Sigrid Nunez, BC Petrakos, Joan Jobe Smith, Mende Smith, Sin Soracco, Michelle Tea, Nichelle Tramble, Sabine Walser, Ann Wood. Consisting of a section in German and a section in English, the yearbook is dedicated to Bukowski’s German translator and friend Carl Weissner and includes two interviews with Weissner (one in each language section) as well as a short memoir about him by Linda Bukowski. 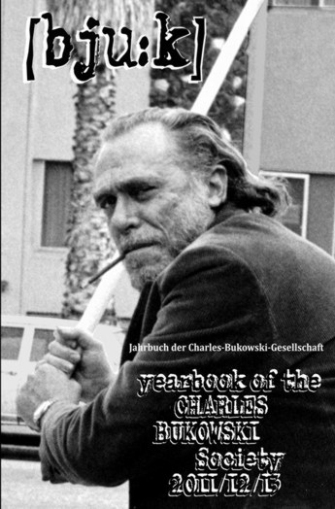 To purchase a copy of Charles Bukowski Society’s 2011/12/13 yearbook, visit bukowski-shop.de. 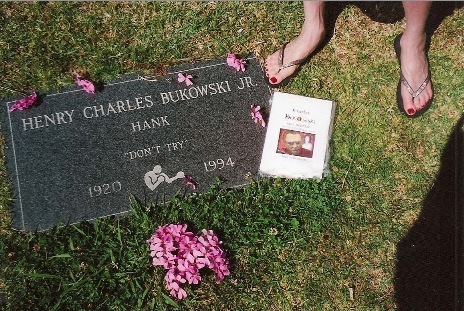 To learn more about the Charles Bukowski Society, visit bukowski.info. To commemorate the 20th anniversary of Charles Bukowski’s passing, we have raffled off two copies of CHARLES BUKOWSKI Epic Glottis: His Art & His Women (& me) by Bukowski friend and confidante Joan Jobe Smith. ABOUT THE AUTHOR: Joan Jobe Smith, founding editor of Pearl and Bukowski Review, worked for seven years as a go-go dancer before receiving her BA from CSULB and MFA from University of California, Irvine. A Pushcart Honoree, her award-winning work has appeared internationally in more than five hundred publications, including Outlaw Bible, Ambit, Beat Scene, Wormwood Review, and Nerve Cowboy—and she has published twenty collections, including Jehovah Jukebox (Event Horizon Press, US) and The Pow Wow Cafe (The Poetry Business, UK), a finalist for the UK 1999 Forward Prize. In July 2012, with her husband, poet Fred Voss, she did her sixth reading tour of England (debuting at the 1991 Aldeburgh Poetry Festival), featured at the Humber Mouth Literature Festival in Hull. In November 2012, Silver Birch Press published her literary profile entitled Charles Bukowski Epic Glottis: His Art & His Women (& me). Find out more at pearlmag.com. ABOUT THE BOOK: In her memoir, awarding-winning author Joan Jobe Smith — a Pushcart Honoree — shares up-close, personal recollections of her mentor and friend, Charles Bukowski. The book also features remembrances and comments from women in Bukowski’s life — including Frances Dean Smith (francEyE), Ann Menebroker, Linda King, and Pamela “Cupcakes” Wood – in interviews conducted by Joan Jobe Smith and poet/author Fred Voss. This years-in-the-making volume also includes poetry, essays, and other writings by Smith and Voss. CHARLES BUKOWSKI Epic Glottis: His Art & His Women (& me) is available at Amazon.com. 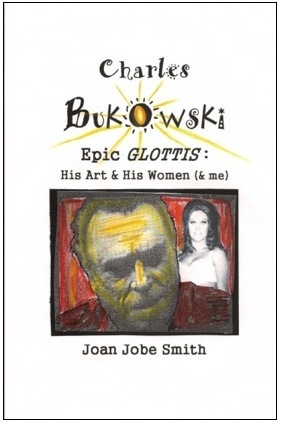 To commemorate the 20th anniversary of Charles Bukowski’s passing, we are raffling off a copy of CHARLES BUKOWSKI Epic Glottis: His Art & His Women (& me) by Bukowski friend and confidante Joan Jobe Smith. If you’d like your name entered into the drawing, just send an email with your contact info to silver@silverbirchpress.com with BUK BOOK in the subject line. We’ll pick a name from the hat on Sunday, March 9, 2014. Stay tuned for a week of giveaways as we count down to the 20th Anniversary of Hank’s departure and pay tribute to the great writer! Sun., 2/23/14, Fred Voss and Joan Jobe Smith perform at LAVA Salon in downtown L.A.
On the last Sunday of each month, the Los Angeles Visionaries Association (LAVA) welcomes interested individuals to gather in downtown Los Angeles (noon-2 p.m.), for a structured Salon featuring formal presentations and opportunities to meet and connect with others. The Salon features two distinct presentations, each lasting about 45 minutes. Admission is free. Joe Oesterle, author of Weird Hollywood and the classics Weird California and Weird Las Vegas will read spooky stories from his books and share anecdotes from his weird road travels, and sign copies of Weird Hollywood. Joe Oesterle is a former Senior Editor of National Lampoon, a visual artist, musician, animator, and curator of the strange and marvelous. At the Salon, Joe will be joined by Count Smokula, a 496-year-old accordion-playing vampire from the vaguely Eastern-European nation of Smokesylvania. A mainstay in the Los Angeles Underground scene, the Count has been described as a cross between Bela Lugosi and Jackie Mason. Poet Fred Voss will read for about 20 minutes from his Bloodaxe (UK) collections Hammers And Hearts Of The Gods and Carnegie Hall With Tin Walls and from Tooth And Fang And Machine Handle, his winning chapbook from Nerve Cowboy‘s (USA) 2013 Competition. Poems mostly about his working experiences, reflections on those experiences, and his 35-year life as a machinist which will include non-machine shop philosophical poems and a couple domestic-comedy “Frank & Jane” poems which bear a striking resemblance to his marriage to poet Joan Jobe Smith. A teenager in 1950s’ L.A., go-go girl in swinging 60s-70s, poet, writer, teacher, mentor, founding editor of PEARL, and confidante of Charles Bukowski for nearly a decade, Joan Jobe Smith will read 20 minutes’ worth of selected poems about the movies, lands of 1,000 dances, and her friendship with Bukowski from her 2012 literary profile Charles Bukowski: Epic Glottis: His Women & His Art (& me), and the 2013 Bukowski Anthology, both published by Silver Birch Press. beside the light of an endless river of silvery moons. …”Endless River of Silvery Moons” and other writing by Joan Jobe Smith appears in the Silver Birch Press Silver Anthology, a volume that Joan Jobe Smith also co-edited. ABOUT THE AUTHOR: Joan Jobe Smith, founding editor of PEARL and Bukowski Review, worked for seven years as a go-go dancer before receiving her BA from CSULB and MFA from University of California, Irvine. A Pushcart Honoree, her award-winning work has appeared internationally in more than five hundred publications, including Outlaw Bible, Ambit, Beat Scene, Wormwood Review, and Nerve Cowboy—and she has published twenty collections, including Jehovah Jukebox (Event Horizon Press, US) and The Pow Wow Cafe (The Poetry Business, UK), a finalist for the UK 1999 Forward Prize. In July 2012, with her husband, poet Fred Voss, she did her sixth reading tour of England (debuting at the 1991 Aldeburgh Poetry Festival), featured at the Humber Mouth Literature Festival in Hull. In November 2012, Silver Birch Press published her literary profile entitled Charles Bukowski Epic Glottis: His Art & His Women (& me), available at Amazon.com. 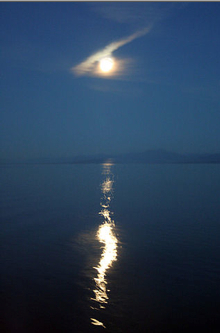 Photo: The moon viewed from a boat sailing the inside passage between Vancouver and Juneau by Tony Hisgett. OFFICIAL OVERVIEW OF THE BOOK: The subject of The Doors Unhinged is the “greed gene”, and how that part of the human psyche propels us toward the accumulation of more and more wealth, even at the expense of our principles and friendships and the well being of society. A Rock and Roll Hall of Fame band, The Doors fractured because of this. In his book, drummer John Densmore looks at the conflict between him and his band mates as they fought over the right to use The Doors’ name. At the same time, Densmore examines how this conflict mirrors and reflects a much larger societal issue — that no amount of money seems to be enough for even the wealthiest people. OUR THOUGHTS: When The Doors started out in 1965, the bandmates decided to share everything equally — and give everyone equal credit. That meant that no matter who had written a song, the credit line would read: The Doors. This has always struck me as smart — and a way of making sure that everybody stayed involved and felt appreciated, because everybody was making the same amount of money. But after frontman/rock god Jim Morrison died in 1971, the three remaining bandmates couldn’t agree about how and when to use The Doors’ music and name, with Densmore as the holdout when it came to selling out (especially when it came to using their songs for advertising). All hail, John Densmore! ABOUT THE AUTHOR: An original and founding member of the musical group The Doors, John Densmore co-wrote and produced numerous gold and platinum albums and toured the United States, Europe, and Japan. His autobiography, Riders on the Storm, was on the New York Times bestseller list, and in 1993 he was inducted into the Rock & Roll Hall of Fame. He has written numerous articles for Rolling Stone, London Guardian, The Nation, LA Times, Chicago Tribune, and Utne Reader. He co-produced Road To Return, narrated by Tim Robbins — a film that won several prestigious national awards and was screened for Congress, resulting in the writing of a bill. He also executive produced Juvies, a film narrated by Mark Wahlberg that aired on HBO and won numerous awards, including 2004 IDA for excellence and U.S. International Film Fest for creative excellence. 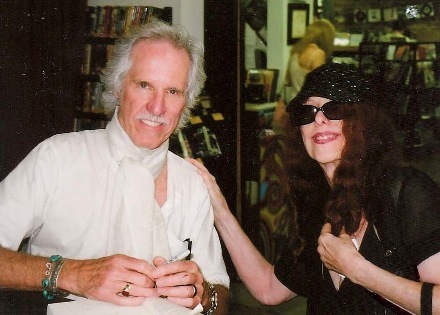 Joan Jobe Smith (pictured in June 2013 with John Densmore) — author of the Silver Birch Press Release CHARLES BUKOWSKI EPIC GLOTTIS: His Art, His Women (& me) — was a go-go dancer for seven years and in 1966 danced live with The Doors at Whisky a Go Go on the Sunset Strip in Los Angeles. 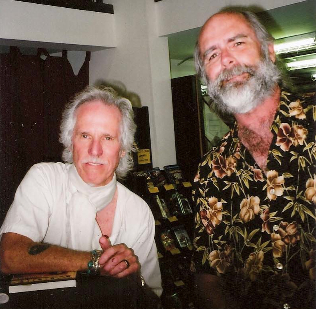 Smith and her husband, poet Fred Voss (pictured at left with John Densmore) — a longtime avid fan of The Doors — attended a book signing on June 1, 2013 at Fingerprints, a record store in Long Beach, California, where they waited in line with hundred of other fans for a chance to meet Densmore and hear about his book. The reading was originally planned for late May, but Densmore rescheduled out of respect for his bandmate Ray Manzarek, who passed away on May 20, 2013 at age 74. 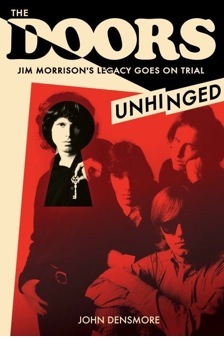 Like Fred Voss, I am a longtime, avid fan of The Doors — and I can’t wait to read The Doors Unhinged (great title! ), available at Amazon.com. Find CHARLES BUKOWSKI EPIC GLOTTIS by Joan Jobe Smith at Amazon.com.